A highly versatile jumpsuit or romper design that is perfect for every occasion. Featuring a tie on the neck for sexiness and a belt to adjust and style it however you like. This flattering design can be dressed up or down and can be worn as off the shoulder (as shown in the images if your shoulders are not too broad) or as a scoop neck that covers the shoulders. 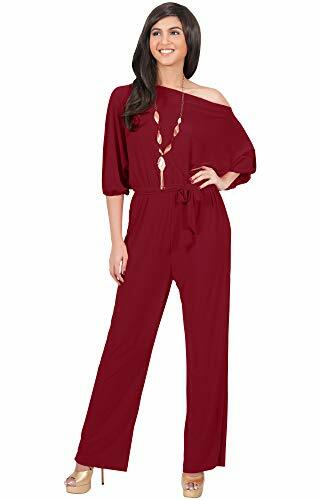 With our wide range of sizes, this simple yet elegant long jumpsuit is the perfect option to wear as a plus size pant suits, maternity jumpsuits as well as pregnancy overall for all body shapes and sizes. The color is Crimson Red and Plus Size 2X Large / XXL / 18-20.